Probability of default in Ukraine has risen to 43%, - Oleksandr Klymenko ⋆ News ⋆ Official website for Oleksandr Klymenko. In 2017, Ukraine is expected for three scenarios of course of events in terms of currency fluctuations. Two out of three will bring the country to default. It was written by Oleksandr Klymenko – the leader of the «Uspishna Kraina» party and former Minister of revenue and duties on his Facebook page. Among the external factors that will influence the exchange rate of hryvnia in 2017, the politician named flow of export, necessity of paying debts to creditors (USD 4.5 billion), foreign direct investment. In addition, Klymenko reminded about the lack of trust in national currency and banking system, nationalization of the PrivatBank and resolution of the National Bank of Ukraine on withdrawal of currency by banks in the form of investments to other countries. According to calculations of the politician, the last decision will lead to outflow of USD 2 billion from the country. «We can also add a number of other factors: low level of international reserves, political instability, war, a desire of currency speculators to earn due to currency fluctuations, ignoring the constitutional obligation on ensuring the stability of the hryvnia by the National Bank of Ukraine, etc.» – the leader of the «Uspishna Kraina» wrote. As a result, according to Klymenko, nowadays, the country faces three scenarios, which he called the “To sell Ukraine”, “Bankrupt” and “Operation Rating of the power”. At the same time, two out of three will bring the country to default. The first scenario means total fulfilment of the IMF requirements – increase in the retirement age, sale of land, elimination of the simplified taxation system, reducing the number of state employees, etc. In this case, the Fund will provide Ukraine with a loan. This loan, together with flows of currency by migrant workers about USD 3,5 billion will be able to hold back the exchange rate UAH 30-32 per one dollar. Oleksandr Klymenko calculated the probability of the “Bankrupt” at 43%. He emphasized that it does not come about technical default, but about real declaring bankruptcy of Ukraine. “It will happen if the government adopts, for instance, not five anti-people laws, but only two. Thus, the Fund will either delay the issuance of credit, or reduce its size, or will not issue at all. It is difficult to say, what will be the exchange rate of dollar. It is obvious that it will go up sharply, “- the politician wrote. The leader of the «Uspishna Kraina» assumes implementation of the third scenario if the government decides to save its ratings. “All the reserves will be sold to a residue. 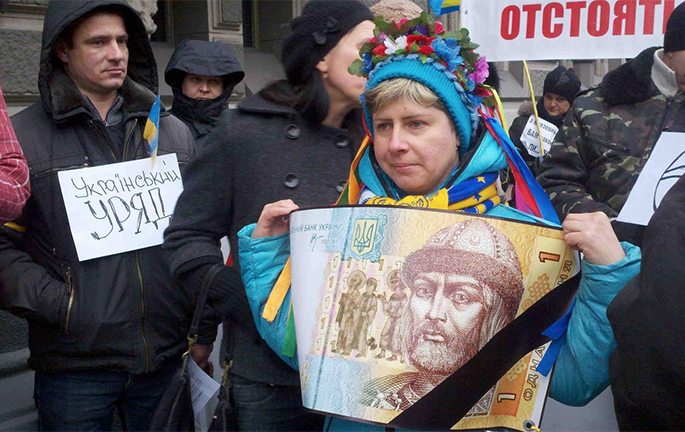 In such case the exchange rate will be the same, namely, about UAH 28 per dollar. However, it will not last for long. In fact, it is the same “Bankrupt” option”, – Klymenko summed up. Let us remind, in August 2016, the politician made forecasts concerning the exchanging rate of hryvnia, which is rather close to reality. Klymenko wrote about the tendency of slow weakening of hryvnia and its fall down to UAH 27 per dollar by the end of 2016. The pessimistic scenario was about UAH 30 per one dollar.